Reduction in slipping, skidding or falling due to accumulation of liquids or exposed cables/wires on the floor. Commercial floor mats are used for a wide variety of applications, not only in industrial workspaces but also in corporate offices for areas such as server storage, entrance, wet areas etc. 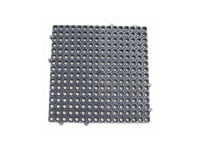 The range of industrial mats includes linkable mats, modular tiles and standard mats. Almost all workplace mats have similar physical properties and usability – however, some mats are processed for special usage in specific industries. Why Use Commercial/Industrial Floor Mats? Commercial/industrial floor mats not only increase the aesthetic appeal of your workspace, but also fulfill a number of workplace safety requirements. Fatigue Relievers- Many commercial or industrial mats are electrically warmed to protect employees against extreme temperatures. Industrial mats are distributed into two primary classifications: dual-functional mats for wet and dry regions and designated mats for dry regions only. The dual-functional mats are designed, manufactured and treated to restrict leakage or absorption. Anti-fatigue mats are highly useful for reducing accidental falls, increasing productivity and decreasing knee, back and neck injuries/soreness. 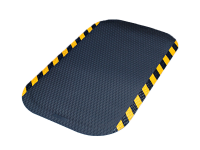 Designated mats can also be used to reduce chances of skidding or slipping. Designated anti-fatigue mats are also called soft floor mats. These mats provide a supportive and comfortable working environment, and are equally popular in industrial areas such as factories and corporate offices. 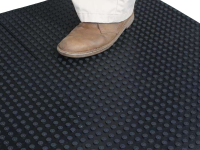 Security Messages - Industrial floor mats can be used for disseminating safety and security information in two ways. The hazard indicator mats are outlined with MUTCD-recommended black and yellow colors that identify an upcoming hazard. These mats are commonly used at the entrance of restricted areas. The second type is logo mats. Safety messages can be printed as graphics, photos or text on these mats. Floor Protection –The workplace mats can protect your floor from chipping or scratches. Some mats also have diamond treading and antimicrobial treatment. These industrial floor mats are composed of high density materials -hence, they can be used in areas with high foot traffic and in extreme weather conditions. Workplace mats can also be utilized to reduce odor and restrict bacterial development. Industry-Specific Protection–Industrial floor mats are essential products for ensuring employee protection and safety in intense working environments. For example, our range of welding safe mats are suitable for metal and assembly working areas as their thick surface can protect workers against electrostatic release (ESD), hot metal shards and sparks. Oil and Chemical Resistance–Considering modern industrial operations, all commercial floor mats are manufactured to restrict the accumulation of oil, chemicals or other liquids on the surface. The cell-blended surface, vinyl base and disposal holes help achieve maximum resistance the accumulation of oils, liquid chemicals and other harmful solvents. Industrial floor mats are composed of commercial-grade rubber and plastic. The manufacturing material is UV-stabilized for minimum discoloration and maximum life of the product. High density polypropylene and rubber composition ensures that the mats can absorb impact, thereby reducing the chances of breakage or damage. The right choice of workplace mats entirely depends on the purpose of use. Not all mats can serve your required purpose. Therefore, discuss the purpose of use with our representative for choosing the right mats for your workspace.